CDR promo of what is otherwise a limited vinyl only release. there are only 300 of the LP, so I imagine there are only a tiny number of the CDR edition. it comes packaged in a white sleeve with paste-on cover and three pages of 8.5″ by 11″ single sheets. the first page is a bio, the other two are lyric sheets. the LP was released by Thurston Moore’s Ecstatic Peace!, but this CDR edition seems to be produced by the artist herself. the music itself is very old school Industrial with very distorted vocals and chaotic, intense analog electronics and tape manipulations. the electronic appear to be home built and she lists a wide variety of sensors at use in her biography like electromagnetic sensors, accelerometers, heat sensors, tilt sensors, and barometric sensors. the loops at use in every track give this a kind of hacked rhythmic sense. all in all it ends up in a very mutant, hacked song form with all tracks in the three-and-a-half to five-and-a-half minute rante which is why I make the Industrial comparison above. still it is very noisy and if one of those old school characters were used for a touchstone it would probably be something like Monte Cazazza’s first single or the first SPK album. 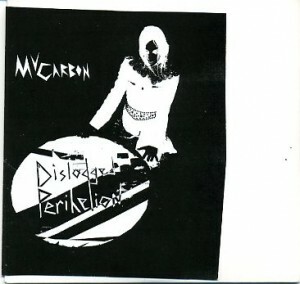 MV Carbon is half of Metalux and was a member of the modern day no wave band Bride of No No. she’s also worked with Aki Onda, Tony Conrad, Evan Parker, John Wiese, C Spencer Yeh, Twig Harper, Bill Nace, John Edwards, Culver, Okkyung Lee, Smegma, Nick Zinner, Brian Chase, and Carlos Giffoni. this appears to be her first full length solo release, although I remember seeing her perform solo at the Wooden Octopus Skull Pfestival in 2006.